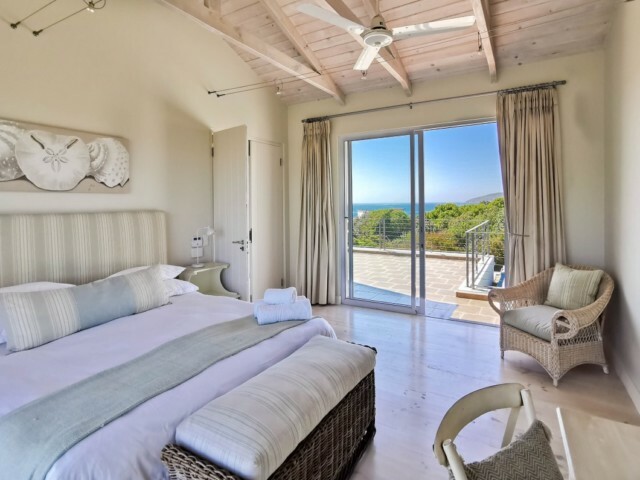 LOCATION: Prime location, corner Longstone Drive & Beachy Head, across the road from Robberg beach, ? 50 metres. Spacious, up market multi-levelled house, ideal for vacationing during the warmer weather. Main living area offers open plan lounge (with small TV), dining-area and kitchen with separate TV room. Outside covered deck ideal for entertaining. BEDROOM 3: Main bedroom fitted with king en suite (bath & shower with separate toilet), inter-leading study with views. - Mandatory housekeeper works Mon-Fri, excluding public holidays (8.30 to 4.30) this is included in the rental. A simple breakfast & light lunch to be supplied by occupants. After hours & weekends to be negotiated directly. Please note that housekeeper is contracted for general housekeeping and laundry (not baby-sitting/child-minding). - The housekeeper will be at the house on the day of your arrival day to show you around (Mon-Fri until 4.30pm). - Staff quarters accessed through laundry, fitted with single pull out bed and en suite (shower/toilet). One set of linen/towels supplied. - Linen, bath and beach towels provided. - Swimming pool, not fenced, but has net, fitted ONLY on request. - Double lock-up garage inter-leading into house with sufficient parking space on property for 2-3 vehicles. - PLEASE NOTE: Bedroom 4 & 5 are not available on this option, should you require use of these bedrooms, they can be made available at additional charge.